“Jade’s Jewel” Street Painting at NE 61st and Tillamook this weekend! 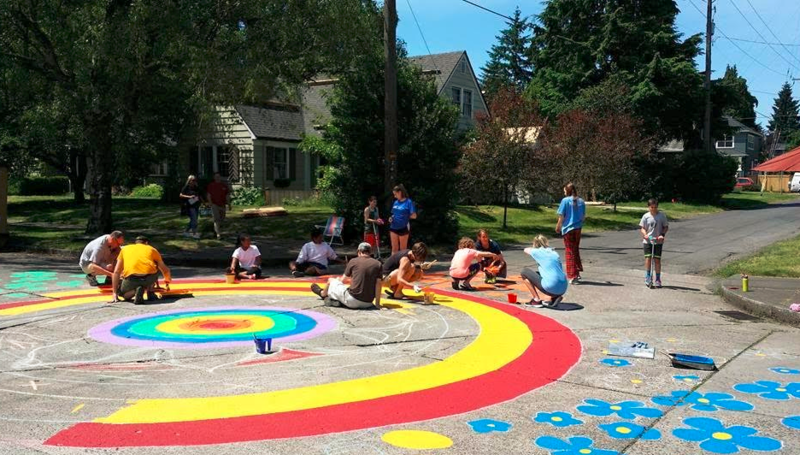 For the third year in a row, streets will be blocked off to paint the bright colors on the intersection of NE 61st Avenue and Tillamook street, Sunday, June 25 from 10am-5pm. Jade Razzano has lived in the Rose City Park Neighborhood all her life and the namesake design called Jade’s Jewel celebrates and beautifies our neighborhood but also slows traffic on the street where her special needs bus picks her up for school. The design is bright and cheery and invites painters of all ages to participate. Parents Joey and Chris Razzano organize the event and donate time and supplies to making this fun event happen but need your help with brushes and donations. Because the paint has a walnut shell additive that prevents slippage, brushes have to be thrown away at the end of the day – so the event is BYOB (Bring your own brush :o) and we are happy to report that the dollar tree on Sandy sells brushes 2 for $1). While the cost of the paint is discounted through the Village Building Convergence and City Repair, and the Rose City Park Neighborhood Association has donated $50 to support the project, another $200 is still needed to pay for the paint. Donations can be accepted the day of the event or at any time. Tents will be set up and music provided for a fun, family-oriented event that you can help with for an hour or all day. There may even be popsicles involved J For more information, there are two pages of information: Facebook (https://www.facebook.com/StreetPaint2015/) and NextDoor. Hope to see you there!